It started with a 'tache. Now our love affair with rugby league is getting serious. 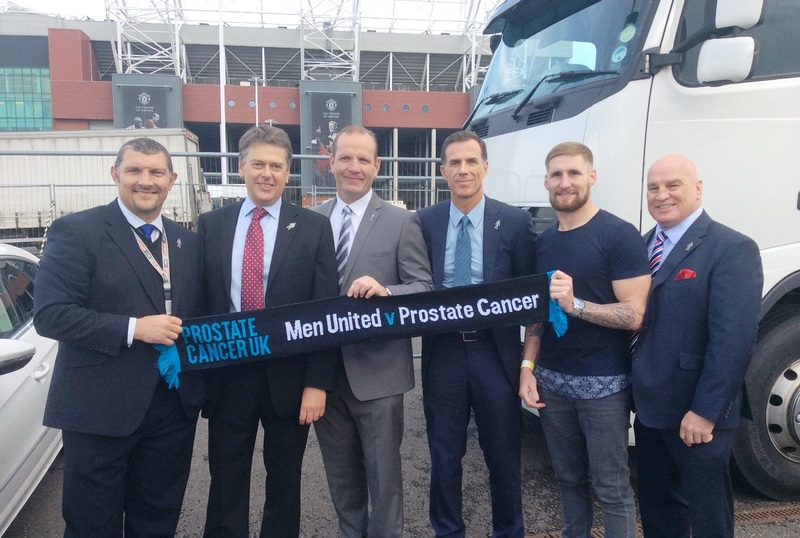 From moustaches to Manchester United and badges to barbers shops, Prostate Cancer UK’s presence in Rugby League is on the rise. Our Sports PR Manager Gary Haines reports from the touchline on the bromance of the year. Recently, North West rivals Wigan Warriors and St Helens locked horns amid a cauldron of noise as the curtain came down on a compelling 2014 Super League season at Old Trafford - and we were in amongst a 70,000-strong crowd. Invited up by our rugby league friends, we were there to meet new faces and pave the way to working even more closely over the next year. Wind the clock back 12 months and Prostate Cancer UK’s presence in the sport was fleeting at best. Conversations had been exchanged and ideas tentatively bounced around, but when Sky Sports rugby league presenter Bill Arthur got involved during Movember last year the tide turned. Bill, a touchline, studio and commentary box stalwart, was diagnosed with prostate cancer in January 2012 by chance. A decision to move house and the mortgage paperwork that followed triggered a chain of events that led to the life-changing news in his doctor’s surgery. 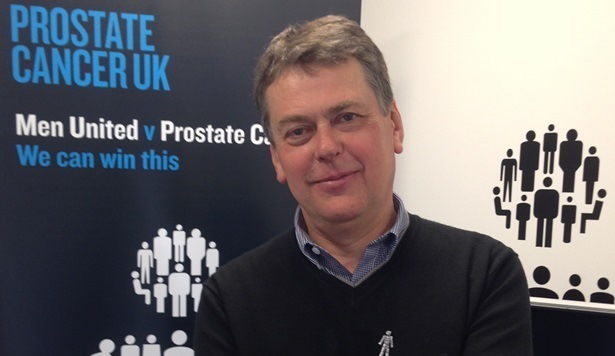 These days Bill is a passionate advocate for Prostate Cancer UK and the driving force behind a startling upturn in our presence in the sport. Thanks to him our Man of Men badge has become a staple part of the rugby league presenters’ wardrobe. And after he started wearing one and giving them out, the icon became the talk of the town. People wanted to know what it was. There was such a buzz about it that Bill’s executive producer, Neville Smith, (who would later complete Ride London for us) suggested Bill answer that question on TV. A few days later Bill was at our London Bridge office interviewing Director of Fundraising, Mark Bishop. He also quizzed Leeds Rhinos duo Kevin Sinfield and Jamie Peacock as well as Jon Wilkin and Paul Wellens from St Helens about why they were wearing the badge. The feature was broadcast ahead of the rivals’ game with Bill and anchor, Eddie Hemmings, also speaking about their personal experiences of prostate cancer. Partnerships were forged with League 13 (the players’ union body) and conversations started with clubs up and down the country. And it didn’t stop there. The then-England skipper Sinfield got behind the Men United v Prostate Cancer campaign and a host of star names followed in his studmarks. Men like Wigan captain Sean O’Loughlin, Leeds stalwart Peacock, St Helens skipper Paul Wellens and many more. As the season rolled on the badges became a prerequisite of the coverage with new faces immediately signed up by Bill. On our side, emails turned into phone calls, and then into meetings as we started to embrace the potential of the sport. The strong heartland of rugby league is in the north of the country, with a couple of exceptions in Catalan Dragons, located in the south of France and London Broncos. Top-flight teams from Yorkshire, Greater Manchester, Cheshire and Merseyside bring a sense of real regional rivalry to the table, and offer us an opportunity to reach out into communities at the same time and reach men and their families in new and innovative ways. Take Widnes Vikings. Brian O’Connor , the Vikings’ Marketing Director, watched with interest when Sky Sports transmitted the Prostate Cancer UK feature and invited us to meet him and his family when Widnes were entertained by London Broncos. By the end of a productive chat over dinner he was won over – and so were we. Next season the club will have the Prostate Cancer UK logo on their shirts as part of a charity partnership. Sinfield, meanwhile, had suggested we get in touch with his local barbershop in Oldham, where barber Steven Palmer had asked for a box of badges to put on the counter. But he wasn’t the only rugby league ace on the books - far from it. Enter St Helens’ Mark Flanagan, son of Terry Flanagan, former Great Britain man and now Chairman of Rugby League Cares, the charitable arm of the Super League. Another England sporting international, former Manchester United man Paul Scholes, also an Oldham native, was a regular in the shop too. A perfect media storm was brewing, and in late July the three VIPs drew national television, radio, newspaper and online media to the barber shop. They were interviewed about their support of Prostate Cancer UK and took the Men United test on camera. The story ran across Sky Sports News for two days with branding and badges prominent and Prostate Cancer UK given strong mentions. 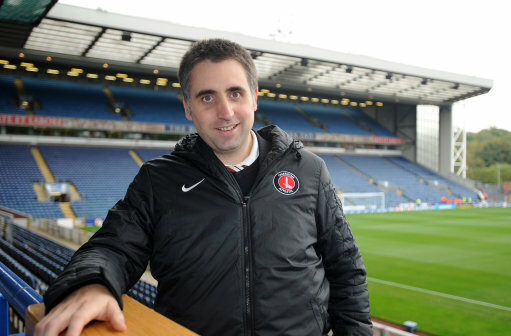 There were also features in The Sun and talkSPORT amid a sensational period of coverage. And we’ve forged contact with the RFL via Rugby League Cares and our Community Engagement Manager, Chris Carter, met Flanagan senior and appeared on Sky Sports magazine show Boots ’N’ All. For a sport that was arguably well off our radar, a lot has happened in a year. And that brings us to the final at Old Trafford. Bill’s generosity knew no bounds when he hosted me, Chris Carter and our Deputy Director of Communications, Alison Day at the final. He started us off with a tour of Sky’s inner sanctum, tucked away at the back of the club’s West Stand car park. We met Eddie Hemmings, long time broadcast colleague Mike ‘Stevo’ Stephenson, and all the pundits including Sam Tomkins, back from New Zealand and, naturally, badged up as soon as he got out of his car. What impressed us more than anything was the knowledge about prostate cancer and the enthusiasm shared by the panel. Here was a group of former players really behind the cause, all of whom were happy to help us however they could, all of whom had taken time out of their busy schedule to meet us. As kick-off approached we headed to our seats – Bill had got us into the executive suite where we chatted to dignitaries from the RFL, passing on badges wherever possible. Looking back to how it all started with Bill’s Movember ‘tache, it was an amazing privilege for us to get the opportunity to mingle with the great and good in the game on such a prestigious occasion. And after seeing St Helens edge out their rivals in an incident-packed affair it was great to see Wellens and Flanagan, a man who made us all a round of tea in the barber’s shop back in July, celebrating. And our conversations are set to continue as Prostate Cancer UK charges down an exciting new sporting path.